It's 2016, So Where are Our Flexible Electronics? If we’ve learned one thing from breathy concept designs and cheesy sci-fi movies, it’s that we all deserve flexible technologies: bio-electric tattoos that measure our vitals and tablets we can roll up to shove in our pockets – that sort of thing. It turns out that making truly flexible devices is harder than futurists and movie-makers imagined. We increasingly see flexible technologies demonstrated at events like CES, but manufacturers tend to show off a single function — a rollable screen here, a stretchable circuit there. Real-life gadgets need to bundle those features together into a neat package, and that’s proving to be a sticking point. But some of the primary barriers to flexible electronics — namely the development of stretchable circuitry bendable batteries — are right now being figured out in research labs around the world. And if those challenges are overcome, you could be in line for electronics that are harder to damage, more reactive to their environments, and change the way you physically interact with them. 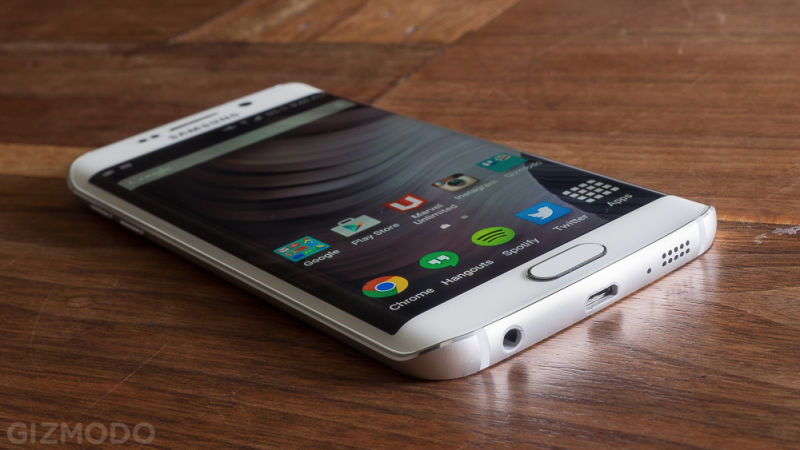 The Samsung Galaxy S6 Edge plays it surprisingly straight despite its flexible screen. As the great bent iPhone 6 debacle 0f 2014 demonstrated, many of today’s devices aren’t imbued with flexibility. That’s because electronics use a complex combination of components, most of which can’t currently be bent. Processors are still etched in silicon wafer, for instance, and you don’t want to think about what might happen if you bent the lithium-ion battery that’s powering your phone. The few examples of flexible electronics that do exist don’t have much to recommend them. Consider a few of the examples you’ve seen on these very pages. Way back in 2012, Wexler released the first ever flexible e-reader and Sony followed up with Paper in 2014. E-readers aren’t intrinsically exciting, but Paper packed a bendable 13-inch e-ink screen which — despite its £600+ price tag — hinted at a future of bendable tablets. Two years on we’re still waiting, because nobody seems to have figured out what to do with the chips, memory, batteries, and so on. In both those devices, they were simply stuffed into an inflexible lump at the edge of the screen. Then there’s the smattering of phones that make use of flexible screens, like the LG Flex 2 and Samsung Galaxy S6 Edge. But as we’ve all seen, a flexible screen does not equal a flexible phone; rather, you get a curved device that fits your face better, or a curious message ticker down one side. Either way, flexibility remains more a quirky gimmick than a truly useful feature. At a much larger scale, Samsung has shown off a TV that can automatically morph from curved to flat with the push of a button. But the screen is 105 inches on the diagonal and the depth of the curvature can be measured in single figures of inches, so the effect is more akin to gently flexing a giant credit card than actually enveloping your face in pixels. These shortcomings can all be attributed to a lack of flexibility in some key components. Imagine stacking a series of playing cards on top of each other. Then think of them as different parts of a simple flexible electronic device: wiring, a battery, a processor, and so forth. Bend the stack a little from the middle, and everything moves in unison; bend it aggressively, and the ends of cards fan out from each other. Your electronic circuits no longer marry up neatly. That might (just) be OK if you only need to roll the device into a tube. But say you want something that conforms to more complex shapes, like a tablet you can crumple like a piece of paper. Thinking back to the stack of cards, you can’t do it, at least not easily, and you might end up damaging something in the process. Instead, you need the component parts — or at the very least what links them together if they can be made small — to be stretchable, so that the different parts can bend with each other into more interesting shapes. Enter elastic circuity, which is finally coming of age. 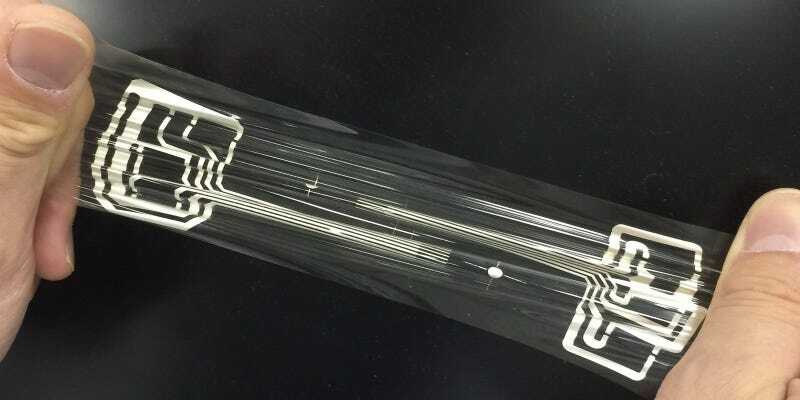 Typically, this circuitry entails some kind of stretchable polymer that’s modified to conduct electricity, and it’s evolved in leaps and bounds in the last decade. In 2008, these types of electronics could stretch by around 70 per cent while maintaining their conductivity; today, it’s possible to create similar fibres that stretch to over 1,000 per cent of their original length. Applied to an elastic polymer base, you can create a stretchable printed circuit board much like the one announced by Panasonic last year, pictured above. And unless you pull some pretty crazy tricks with your phone, it’s hard to imagine a situation where you need more elasticity than that. Some components are a little more difficult to flex, but fortunately there’s a general trend in electronics that can help. “The trajectory of the traditional semiconductor industry is all around miniaturisation—making things smaller and thinner,” John Rogers, a professor in engineering from the University of Illinois, told Gizmodo. “Those trends have relevance and importance for flexible electronics.” That means that some parts — like radio antennae and simple sensors — are naturally starting to become so thin that they’ll be flexible enough without much extra research. Another option is to share resources that happen to be nearby: there may be no need for a device to come packed with powerful hardware when a lightning-fast smartphone is around. We’ve seen that with smartwatches to some extent, and there’s no reason it couldn’t be the case for most flexible devices either. All that’s required is some kind of wireless data link to quickly beam information back and forth. There’s still one major fly in the ointment. “Power supplies are a barrier,” Rogers admitted. “You can make most components small enough in lateral dimensions that you can engineer the soft mechanics you ultimately want.” But that’s simply not the case with batteries, where the capacity of a cell is dictated by its volume: make one thin enough to be flexible, and it barely holds any charge. That’s of little use, especially given the rate at which most devices now chew through charge. Wireless power is likely the best solution. “In that case all you really need to do is to create flexible antennae to receive the power,” Rogers said. There are already houses in Seattle that are part of an experiment to test how practical that approach might be. There, devices seize the oscillating signals in the data streams of Wi-Fi and turn it into direct current. Currently it powers only small devices, but at this year’s CES we saw Ossia’s wireless system charge an iPhone in mid-air, which will be a commercial reality by the end of 2016. Your TV might do a better job of warping its shape than Samsung’s current efforts, for instance. Subramanian pointed out that it could in fact bend both ways: in concave mode the TV could provide a truly immersive experience, while in convex mode it could allow multi-player games without letting you see your opponent’s view. Your tablet may flex in half — a little like the Lenovo Yoga – but as a single, continuous screen, which would allow you to curate a slide show of images on one side, say, while your viewer sits opposite. Or your phone might use its ambient light sensor to notice the sun shining on it and morph its shape to shade your screen. There are plenty more potential applications where those came from. But, as Subramanian has told me in the past, these kinds of technologies are revolutionary, not evolutionary: they’re a step change in the way we use electronics. The reason we’re not seeing a bendable tablet yet may be almost as much to do with manufacturers taking small steps, in order to avoid overwhelming us, as it is with the readiness of the hardware itself.